The Villains are looking for non-union actors of all genders for our winter production of FOX. FOX is a new work by Dan Bray with Kathryn McCormack and Colleen MacIsaac, a subversion and reimaginging of Ben Jonson’s ‘Volpone’. This site-specific work turns a classical comedy into a contemporary courtroom drama, exploring the hardships that have and continue to face women who come forward in sexual assault cases. Auditions will run Sunday January 6th. 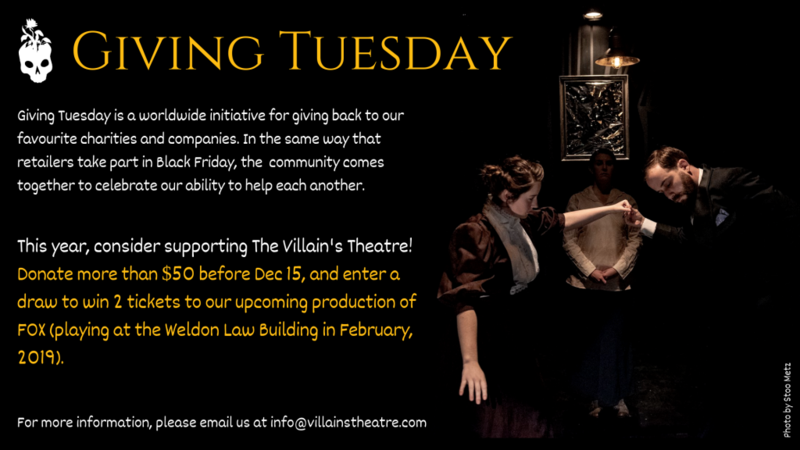 Please e-mail info@villainstheatre.com with your resume and headshot to sign up for a slot. We ask that you prepare a classical monologue, and you may be asked to read sides. Rehearsals would run mid-January till Feb 19, for a run February 20-24 at the Weldon Law Building at Dalhousie. Some daytime weekday availability may be required for rehearsals. Click here for more info.